The Toronto Maple Leafs have made a big splash nearly a month out from the trade deadline, acquiring defenseman Jake Muzzin from the Los Angeles Kings in exchange for Carl Grundstrom, Sean Durzi, and their first-round draft selection in 2019. In Muzzin, the Leafs have added a 29-year-old, 6’3, 213-pound left-shot defenseman who has played tough, all-situations minutes on the Kings blue line. He’s typically been good for about 40-45 points a season and is a 53+% CF over his last three years (among all NHL D with a minimum 2,000 minutes played, that ranks 15th in the league). Muzzin adds an element of size and experience (Cup winner) to the backend and has positive impacts at both ends of the ice — he’s 20th in Shots Against per 60 and 29th in Goals Against per 60 over the last three seasons among defensemen with a minimum 2,000 minutes played. Offensively, he’s 13th in CF/60, 40th in SF/60, 91st in GF/60, 17th in SCF/60, and ranks 33rd among all NHL defensemen in 5v5 points. In addition to bringing size/physicality and the ability to stop cycles in the defensive zone, he can move the puck and he brings a heavy shot/one-time option that wasn’t present among the Leafs blue line ranks. Aside from the handedness factor, he checks a lot of the boxes as far as filling needs on the Leafs defense corps. "9. Drew Doughty got the All-Star nod, but Jake Muzzin has been Los Angeles’s best defenceman. The price is high, but someone is going to seriously consider it." Indeed, Muzzin has outperformed Doughty this season. I think he’s an elite defenseman. He’s going to bring the physical aspect, but he has poise and patience to make plays. I think the adjustment will come naturally for him because he is a top defenseman. 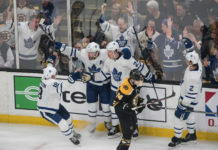 Pushing the soon-to-be 38-year-old Ron Hainsey down the lineup was clearly a necessary move and this gives the Leafs the legitimate top pairing they’ve been searching for that can match up against the powerful top lines they’ll encounter within the division in the playoffs. While it means there will be five lefties in the Leafs‘ top six, this is something Babcock is familiar with from his time with the Red Wings. Morgan Rielly could shift to the right or they could put Muzzin there straight away; they could acclimate Muzzin into the new team and system on his natural left-hand side, where he has been playing next to Alex Martinez (who has been on the right) this season in Los Angeles, or they may want to keep the ball rolling with the amazing season Rielly is currently having on the left and slot Muzzin in on the right side immediately. Either way, that is a big upgrade and it looks like something much closer to a defense capable of contending in the Atlantic. Getting this deal done well in advance of the deadline gives the Leafs more time to find the right spot/fit and get Muzzin acclimated before the playoffs. 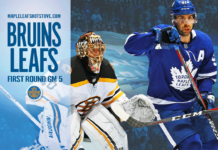 The addition with 30+ games remaining should also help the Leafs in their battle to secure home ice in the playoffs. Muzzin is signed for one more season at a $4,000,000 cap hit, so it is not a straight-up rental; the Leafs will get at least two attempts at Cup runs with him in the lineup. The price of prospects Grundstrom and Durzi — two second-round selections — plus their first round pick this season (likely falling between selection #24-31) isn’t cheap, but they have given up no assets off of the NHL roster and have managed to hold onto their two top prospects in Rasmus Sandin and Timothy Liljegren while significantly upgrading their defense as the Cup window opens this Spring. In addition to drafting and developing players for the big club, this is what you spend all of that time and effort accumulating draft and prospect capital in order to one day do — fill holes to put the team in a position to take runs at the Cup. There is also the matter of what this means for pending UFA Jake Gardiner’s future in Toronto — likely not good things — but that’s for another day. Jake Muzzin can play the right side and would seem like a natural candidate to go play alongside Morgan Rielly. That probably means Ron Hainsey gets pushed down to the third pairing and Igor Ozhiganov gets scratched. Would mean one righty on Leafs defense (normal for Babcock). Scouting: Flashy rearguard with excellent size, good hands and mobility .. agility and first two-step quickness stabilize his stride .. appears heavy-footed moving backwards – with awkward transitions .. confident puckrusher, shimmys by stickchecks and engages long swooping strides .. shoots into the neutral zone with controlled zone exits – and excels moving the puck up ice with strong outlet passing .. mobility and stickhandling range make him difficult at 1-on-1 .. patrols the blueline and fires pucks towards the goal at will .. gets into trouble when he overextends and skates into jams .. safe and boring plays are effective, even if unspectacular .. poised when distributing pucks on the power play, with a rocket one-timer for a skills combo .. defensive patience is underdeveloped – resorts to clears and dump outs to center ice under duress .. tends to lose patience and wanders – yet recovers and closes gaps quickly making effective use of his body size and stick placement .. not overly physical but will dish out the odd big hit. Analysis: Left something to be desired in 2016-17, but he bounced back last season with eight goals and 42 points, his third campaign of at least 40 points in four years .. set the tone early with a season-high six-game point streak from Nov. 7-21 (6-2-6-8) .. recorded a point in eight straight games from Jan. 2-30, but that one comes with an asterisk because he missed three games from Jan. 6-15 due to an upper-body injury .. also missed the final five games of the regular season and the first two games of the playoffs due to a separated shoulder .. averaged 2:15 minutes per game with the man advantage, resulting in 14 power-play points .. the 28-point 2016-17 campaign will probably go down as an anomaly considering he’s a reliable secondary offensive contributor.